Randy Yee: How and when did you first get interested in cars? Bob Speights: I became interested in cars at a very early age. My dad was involved in the automotive industry and I had an Uncle who raced on the beaches of Daytona so needless to say I had cars in my blood early on. One of my first jobs was during the summer while I was still in High School working for the local Chevrolet dealer. I still remember when they asked me to deliver a 427/425hp Corvette back to the owner after it was serviced. So I am comfortable to say I have been interested in cars my whole life. RY: Tell us about your current stable of cars. BS:First of all if you are wondering which came first my interest in Z cars or the job with Nissan, it was my attraction to sports cars and the Z. My “stable” currently includes 3 Z cars and a vintage motorcycle. The Z cars include a 1972 240, 1994 300ZX Twin Turbo SMZ and a 1996 300ZX. Each of the cars and the motorcycle provide me with different levels of enjoyment. The 240Z has now become the show car, the SMZ will hold its own at shows, is the most fun one to cruise in and the 96 300ZX is my everyday ride. I can turn up the radio and enjoy some of the back roads on my way home from the office for some “unwind” time. g. Options No factory options. The car came with a 4 speed manual transmission, AM-FM radio, power antenna. The car also has polished aluminum wheels which were a popular dealer installed option at the time of sale. RY:Anything else you’d like to say about the car. Say as much as you’d like. BS:This is now the third 240Z that I have owned. I bought my first 240Z, which was identical to the one I currently own, in 1972 but unfortunately, it met an untimely demise due to another driver running a stop sign. I bought this one while I was living in Southern California about 7 years ago. I had been stung by the “bug” to buy another Z and found this one nearby. The 240Z had a big impact on the sports car market in the US after it was introduced in late 1969. Its large acceptance as an affordable sports car with great styling and very good quality set the standards for others to follow. It immediately became a success on the racing circuits as well. This is an example of one of, the slightly more than 50,000, 240Z’s sold in 1972. This car was one of the first 1972 Z’s built. It was actually produced in October 1971 and was sold by Hayward Datsun in Hayward California on December 15, 1971. In 1999, the restoration of this Z began. It is sometimes thought be one of the Z’s Nissan restored in their Vintage Z Program, however it is not. The car has only 68,000 original miles on it and now enjoys the good life of going to numerous car shows and on weekend excursions. At the car shows it always draws a crowd and has won numerous awards and trophies from Florida to California. 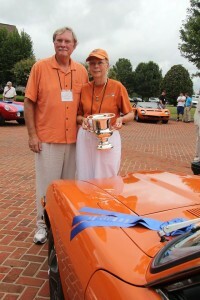 The most prestigious award, the Gold Medallion Award, was the recently bestowed on it for concours excellence by the Z Car Club Association at the 2007 National ZCCA Convention this summer. In the fall of 2002, this car appeared in the Ultimate Swimsuit Edition of Sports Illustrated Magazine. Nissan used it then to re-create a retro ad for this special edition publication during the national marketing release of the 350Z. The car was also loaned to Nissan for the launch of the 25th Anniversary Z at the SEMA show and the national billboard campaign that followed the show. Additionally, the car was on the cover of the Sport Z Magazine for the 2004 spring edition and Hemmings Sports and Exotic Car Magazine. RY: Anything else you’d like to say about the car? Say as much as you’d like. BS: The SMZ version Z was created by Nissan and Steve Millen, former IMSA GT Champion, for the 25th Anniversary of the Z. This is car #11 of only about 100 that were produced for the US market. Steve’s racing heritage can be seen in the package components that were applied to this limited edition car. This particular car was used by Nissan for its marketing and publicity information. It appeared in the June 1995 edition of Car and Driver Magazine. This Z is my fun Z. It is a pure joy to drive! If you want a car that handles, is fast and an attention getter then this is the car. Randy do you want to take it for a spin? BS: This Z is one of the last Z’s made before the suspended production of the Z until 2003. It is only one of 52 that were produced that year with a “slick top” (non-T-Top). RY: Do you have a favorite? BS: That is really hard to pick. If you had to pick your favorite son or daughter how would you select one? I guess I would have to select the 240Z. It is my labor of love and brings back many memories. RY: What’s your greatest automotive memory? Could be an event you participated in or how you purchased the car, etc. BS: I would have to say being awarded the Gold Medallion Award at the 2007 International Z Convention. In the Z community there isn’t a bigger award than it. The event was held at the Daytona International Speedway which is not far from where I grew up. I used to cruise the beaches on the weekend in my first 240Z and Daytona also brought back memories of my uncle racing there. I was also joined by my whole family for the show which was very important to me. RY: Any cars that you hope to add to your collection? BS: I have always had a fascination with the 37 Ford. The tear drop headlights inset in the fenders and the grille are the focal point of attraction for me. So some day I hope to add a 37 Ford hot rod to the garage. RY: Any hobbies outside of cars? If so, describe. BS: I enjoy golf and I have always had a fascination with airplanes even thought I do not actually desire to become a pilot. One of Bob’s wonderful model planes. Members I hope you are enjoying this section. If you would like to have a profile done on you and your cars contact me Click Here!